How is CCBRT’s capacity building team training the next generation of #HealthHeroes in Dar es Salaam? Inside one of Dar es Salaam Region’s busiest neonatal wards, Ladness is doing a late-morning round at the Neonatal Intensive Care Unit (NICU). She bends over an open cot to inspect a premature newborn. It’s obvious from the way she looks at the young child: she is passionate about her job. Ladness is one of the nurses trained in neonatal care at Mwananyamala Hospital. She attended several trainings on newborn care facilitated by CCBRT’s Maternal and Newborn Healthcare Capacity Building Program. The knowledge and skills gained through these trainings have transformed her work, touching the lives of her patients, her co-workers and her co-workers’ patients. 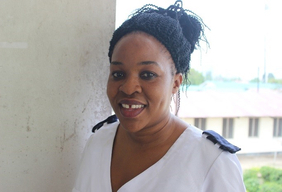 “I have been able to pass on the knowledge from CCBRT trainings to untrained nurses and volunteers in the ward. Together, we’ve really improved the management of newborn illnesses and complications,” she explained. Mwananyamala Hospital is one of 23 health facilities supported by CCBRT’s Maternal and Newborn Healthcare Capacity Building Program. Data show significant improvement in the quality of Maternal, Newborn and Child Healthcare services at the hospital; from 5% in 2010 to 85% in 2016.